Anas ibn Malik (Allah be pleased with him) relates that if any distress befell the Prophet (Allah bless him and give him peace), he would say: Ya Hayyu Ya Qayyum, bi-Rahmatika astagheeth (‘O Living, O Sustaining, in Your Mercy I seek relief!’). The Living (al-Hayy) is the One who alone has absolute, independent life. The Sustaining (al-Qayyum) is the One who alone needs none to sustain Him, and who sustains all things at all times, in every way. Relief (istighatha) is seeking assistance and salvation from danger or distress. Transliteration: Allahumma laa sahla illaa maa ja`altahu sahlan, wa anta taj`alul-hazna idhaa shi' ta sahlan. 1. This is referring to the verse; Allahu La ilaha illa Huwal Hayyul Qayyum-(1st line of Ayatul Kuris). 3. Surah Ale-Imran and Wa Anatil Wujoohu Lil Hayyil Qayyumi in Surah Ta-Ha. "Whoever recites Aayatul Kursi after every obligatory prayer nothing except death prevents him from entering heaven." (That is say that the only thing that is preventing him from entering heaven is death. When it will come, he will go straight into paradise). Abdur Rahman ibn Awf radiyallahu anhu used to enter his house, he used to recite Aayatul Kursi in all four corners of the house, to keep satan away. A piece of extra info which has come to my heart if there is a jinn in that house or evil thing you MUST leave either the door open or window open as they need an exit to leave the house when blowing into the four corners of the house also blowing isn’t mentioned but that also needs to be done in each corner too. So you need to read in each main corner of the house Ayatul Kursi and blow in all 4 corners and leave a window for the thing to escape the house otherwise it will be trapped and may cause more trouble. "Whoever prays at night ten verses of Surah Baqarah the devil will not come to that house until morning: Its first four verses, the Throne and the two verses following it and its last three verses, the first being lillahi maa fis samaawaati." "Allah Ta’ala finished Surah Baqarah with two verses which I have been given from His treasure which is under the Throne; so learn them and teach them to your women-folk for they are a blessing, a means of approach (to Allah Ta’ala) and a supplication." A saying of Ahmad b. Taymiyya which his student Muhammad b. al-Qayyim (Allah have mercy on both of them) relates in two of his books: Madarij al-Salikin and Tariq al-Hijratayn, in which he says that reciting “Ya Hayyu Ya Qayyum, la ilaha illa ant” every day 40 times after praying the Sunnah of Fajr and before the Fard “revives the heart” and “has an astonishing effect” respectively. Another Prophetic Supplication used by Prophet Yunus (a.s) for Trials Called Ayatul Cream or the Verse of Distress. Combining the secret of Dua of reviving the heart and Ayatual Cream as used by Qadiri-Noshahi tariqah: Ya Hayyu Ya Qayyum with La ilaha illa Anta, Subhanaka, inni kuntu mina z-zalimin. This is a Hidden Qadiri-Noshahi Dua which I will share never ever before posted anyway were on the internet. Ya Hayyu Ya Qayyum bi-haqqi La ilaha illa Anta, Subhanaka, inni kuntu minaz-zalimin. O Ever-Living, Oh Self-Existing for the sake of There is no deity but You. Glory be to You! Verily, I have been among the wrongdoers. Litany of Al-Tirmidhi for "Protection of Faith"
O Ever-Living, O Self-Subsisting! O Primal Origin of the Heavens and the Earth! O Possessor of Majesty and Honour! O Allah, by the sanctity of Imam Hasan, his brother [i.e. Imam Husain], his grandfather [i.e. Prophet Muhammad, Allah bless him and give him peace], his father [i.e. Imam Ali], his mother [i.e. Lady Fatima], and his progeny – deliver me from the sorrow that I am in. O Ever-Living, O Self-Subsisting! 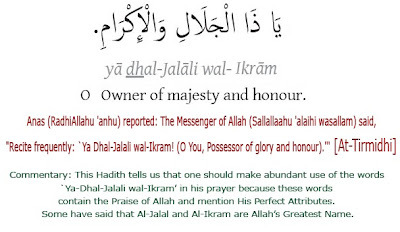 O Possessor of Majesty and Honour! I beg You to revive my heart with the light of mystical intuitive knowledge of spiritual truth [ma’rifa], O Allah! O Allah! O Allah! O Essence of Mercy! 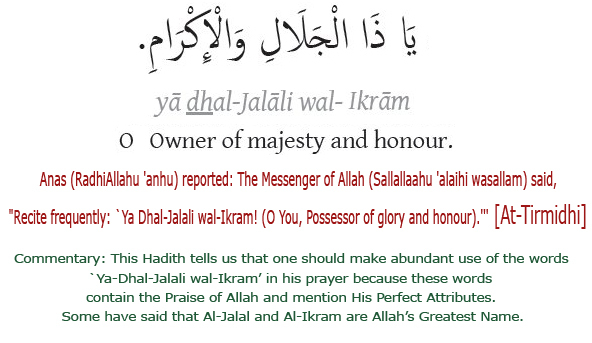 As for mentioning ya dhal-Jalali wal Ikram this is a sunnah recite it abundantly. 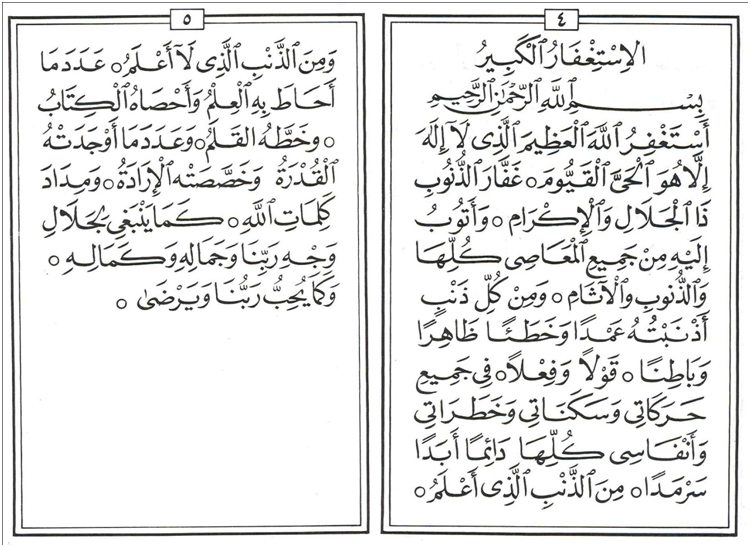 Yaa Hayyu Yaa Qayyoom used in forgivness dua of Sidi Ahmed ibn Idrisi's dua Istighfar al-Kabir-"The Magnificent Forgiveness"
kama yanbaghi li-jalali wajhi Rabbina wa jamalihi wa kamali hi wa kama yuhibbu Rabbuna wa yarda. I seek the forgiveness of Allah the Great, there is no god save He, the Living, Sustainer of Life, the Forgiver of sins, the Majestic and Generous. And I turn to Him in repentance from all acts of disobedience, and all sins and offenses. From every sin that I have committed intentionally and unintentionally, openly and in secret, in word and deed. In my every action and my every stillness, my every thought and my every breath, always and forever and eternally. From the sin that I am aware of and the sin that I am unaware of. To the number of all things contained in His knowledge, registered in the Book, written down by the Pen, and to the number of all that His omnipotence has created, and His will chosen, and as much as the ink of Allah’s words. As it befits the Majesty of the Face of Allah, and His Beauty and Perfection, and as our Lord wishes and as He pleases. Shaykh Ahmad ibn Idris wrote about the Istighfar al Kabir: “I sent it to one of the awliya-(Saints), so he wrote me a letter in which he said: ‘I read the istighfar that you sent me one time and Allah forgave me allmy sins so that nothing of them remained.’ And this means that he knows that Allah forgave him, a real and true knowledge, otherwise how could he have said: ‘He forgave me’? Al-Khidir, alayhi assalam, said: “What is that, oh Prophet of Allah?” And so the Prophet, alayhi assalatu wassalam, taught him the Idrisi Tahlil, the Salaat Azeemiyya, and the Istighfar al-Kabir". Here i have only mentioned Istighfar al-Kabir as for the Idrisi Tahlil, the Salaat Azeemiyya i will mention that in another post with full commentary too, the above starts at the beginning asking Allahs Forgiveness and the salawat below known as salawat Uwais, Allah is sought for this forgiveness through the same line but it appears at the end of salawat Uwais. Allaahumma Salli 'alaa Sayyidinaa Muhammadiun Wa Aalihee Wa'itratihee be 'Adadi Kulli Ma' loomillaka Astaghfirullaa Halladhi La ilaahaa illaa huwal Hayyul Qayyoomu Wa Atoobu ilaih. Yaa Hayyu Yaa Qayyoom. Meaning: Oh Allah, bestow Your Choicest Blessings upon our Master Muhammad (Peace be upon Him) and upon his extended family and his progeny according to the number of all things known to You. I seek the forgiveness of the One but for whom there is no God, The Truly and Perfectly Alive and The Self Sustained and I turn to Him with repentance. O The Truly and Perfectly Alive O The Self Sustained. It is highly recommended that those who seek the love and closeness to the Beloved of Allah, Hadrat Muhammad (Peace be upon Him) make it mandatory upon themselves to recite this Durood Shareef according to their capacity and the time they have available. For instance at least 11 times after each Salat. It should be recited more frequently after Isha, Tahajjud and Fajr. 100, 300, 500 times or even more. Remember though, once the frequency is fixed, be steadfast upon it! - Taken from - from Shaykh Hazrat Abu Anees Sufi Muhammad Barkat Ali.